This post is part of a blog hop. I've no idea where it started from and like all good chain mail, no idea where it will end. If you've found your way here from Georgia's Inner City Stinge blog, then I would like to take the time to say hi! I started this blog almost 9 years ago now. I can honestly say I started because I was jumping on the bandwagon. It was something new and shiny. Once I started I found my blog useful to go back and look at the things we did when it came time to journal on my scrapbooking layouts. I keep this blog as a remembrance tool, somewhere where I can look over my life and smile at the things we've done, the places we've gone and the creative things I have made. How does my writing differ from others in it's genre? I don't know that I am different from the other crafty people out there. I don't know if I have a special voice. All I know is, I like to share my crafting endeavours and a little bit of myself. The question should be what am I NOT working on? I am always scrapbooking, project lifing, sewing, crocheting, thinking and dreaming of crafty stuff to make. Do I write what I do? Yep. You can't really fake the crafty stuff, I guess. For me it's pretty simple, if I have a project, I write about it. If we have done something, I write about it. If I have some photos to share, I write about it. I don't share everything though as I'm always worried that people won't want to read my content. I need to stop thinking like that, because at the end of the day, my blog is about me for me, and that's all that should really matter. Rachael started her blog 6 months before her 40th Birthday, debating whether she was going through a mid-life crisis and freaking out by focusing on exercise and trying, trying, trying to eat better. Helen's blog is all about her adventures in growing her own produce, foraging for local produce and supporting my local community on a shoestring budget and loving what she does. 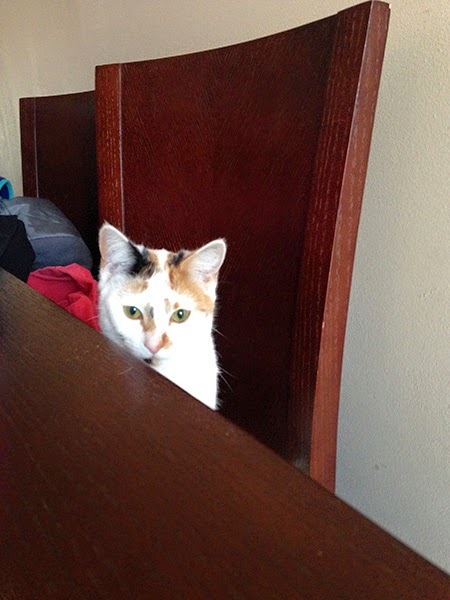 Yes, that's a photo of Pixie, sitting at the kitchen table. It's like I'm having a conversation with myself when I'm writing my posts! LOL!